Outlander Season Finale – To Ransom a Man’s Soul – What are you reading? In the season finale of Outlander, Jamie Fraser is pulled from the brink of Hell by the one who loves him the most. As I stated last week, please do not read this recap if you haven’t seen the season finale. Do yourself a favor and see it first before reading. The episode mostly concentrated on what happened between Captain Randall and Jamie, which was horrific and very, very hard to watch. Black Jack used not only physical violence to get what he wanted from Jamie, but mental and emotion violence, as well. He used threats of harm to Claire to subdue Jamie and to eventually break him. The man we all knew as a warrior and a fierce protector of those he loved was turned into a shattered shell of his former self. All he wanted was to meet Death swiftly and leave the horrors behind, even though it meant leaving Claire alone. Thankfully, Claire’s love for her husband brought him back from the brink. She refused to give up on him, but more importantly, refused to have Jamie give up on himself. Claire reminded him that yes, even after all he’d been through, Jamie was still loved. But if he still wanted to die, she would die along with him. When I read Outlander, the abuse that Jamie experienced was difficult to read and I shed tears for him more than once. The writers and actors of the show took this painful subject and treated it with care. There was no gratuitous violence or extreme show of blood and gore. Instead, Jamie’s ordeal was played out in a way that made viewers wish they could rescue him from Wentworth Prison themselves. They cried with him and Claire because they knew that Captain Randall would not stop until he made Jamie his on some level. They felt Jamie’s fear, Claire’s helplessness and Randall’s desire. But viewers also felt the love between Claire and Jamie and knew that someway, somehow, it would prevail. Now that I have had a bit of time to digest this episode, I can say with certainty that Outlander will be nominated for at least one Emmy award because of Tobias Menzies. Before the Caitriona and Sam fans go ballistic, keep reading. 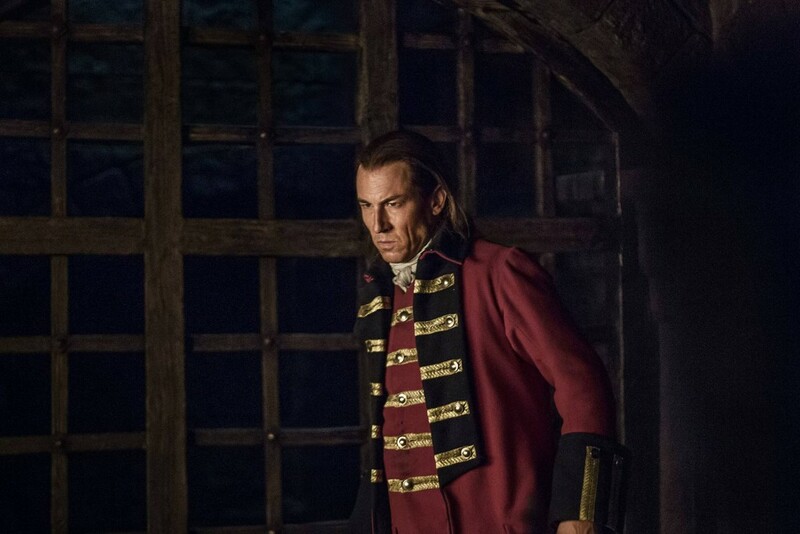 Tobias Menzies, in my opinion, has gone above and beyond who I thought Captain Jonathan “Black Jack” Randall would be. He became Black Jack and made him real. His obsession for Jamie was made true and it was disturbing to watch. Tobias used his exceptional skills to make his character (one of two he plays on the show, I must remind everyone) one of the most hated of all time on television. If Tobias isn’t nominated for an Emmy, I would be extremely surprised. He definitely deserves it. That being said, Caitriona Balfe and Sam Heughan are marvelous as Jamie and Claire. Their chemistry is electrifying and seeing them together made their characters all the more real. You root for Jamie and Claire, even when they’re fighting (which they do a lot). The love they feel for each other is almost painful, it runs so deep. I’m looking forward to seeing what happens to the Frasers in season 2. What did you think of the first season? Do you have a favorite episode? What did you love or not love about Starz’s adaptation of Diana Gabaldon’s books? Take a moment to leave a comment or share your thoughts. Thank you so much for reading our recaps of the series. We’ll see you again when the second season of Outlander premieres. Enjoy the summer!